All activities FREE unless otherwise noted. 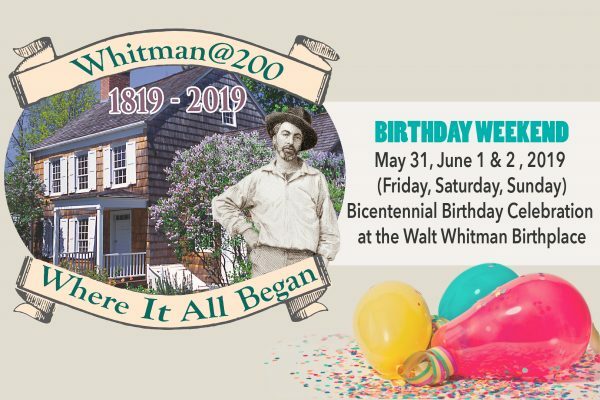 Friday, May 31, 2019 – Walt Whitman’s 200th Birthday! Born here on May 31, 1819. 9:00 am – 9:00 pm Tours of the Historic Birthplace begin and run throughout the day. $5 per person. 10:00 am – 12:00 pm Whitman scholars David Reynolds & Jerome Loving panel presentation. Noon – 5:00 pm Activities include a Poet’s Corner and Whitman-era music and crafts. 5:00 pm – 6:00 pm Join fellow Whitman enthusiasts for a “Happy Birthday Hour” and toast Walt in honor of his 200th birthday. 7:30 pm – 8:30 pm Compagnia de’ Colombari presents More Or Less I Am, a music- theater piece drawn from Walt Whitman’s 1855 “Song of Myself.” The troupe, comprised of 8 actor/singers and 4 musicians, will circulate in the Town of Huntington Friday afternoon reciting poetry in open spaces as prelude to evening performance. $5 per person. 9:00 pm Closing Whitman revelries. 1:00 pm – 3:00 pm Bring lunch or enjoy food truck offerings and join us for a Poet’s Picnic with a musical presentation featuring Whitman-era music. 5:00 pm – 6:00 pm Multitudes: a one man play about the life of Walt Whitman. $5 per person. 6:30 pm – 9:00 pm The Bard’s Initiative, a local poetry group, will stage a marathon reading of Leaves of Grass in front of the Birthplace. 10:00 am – 5:00 pm Tours of the Historic Birthplace begin and run throughout the day. $5 per person. 10:00 am – 5:00 pm Whitman in the Park, High School and College Students offer presentations of their poetry, art and theatrical works. Docents dressed as historic figures circulate with visitors. Participating schools include Adelphi University, Long Island High School for the Arts, Paul Gelinas JHS, and Walt Whitman High School.